This is what things looked like when we initially arrived at the scene. On Saturday 7/28 I helped a couple of friends with a cut out. It was at an old abandoned house about 25 minutes South of me. I am not a huge fan of removing established feral bees, but this house is going to be torn down before this winter. We arrived at the house at approximately 6:00 a.m. Some of the loose siding boards were removed first. The guard bees let all three of us know that they weren’t interested in leaving. Though all of us were wearing protective equipment we each took quite a few stings. It was coordinated effort as I took about 10 stings to my “covered”‘ arms between where the gloves ended and my veil began. I also got stung several times on the legs and on my belly between the veil and my belt. All of it came within about 30 seconds. They got my attention for sure! Part of our problem was we really didn’t know what we were getting into. This is the case with any cutout. Cecil had been to the site to investigate. He reported that they were at about chest level going in and out the side of the house. We figured we would cut in and remove them quickly. We had planned on being done by 8 or 8:30. We never would have guessed this hive to be so large and populous. Mike attempting to remove the sections of comb. As we continued to remove siding we got to a point where we had to scrounge a ladder from a local man who had been observing us from a considerable distance. When it was all said and done we found comb from the footer all the way up to a board that separated the first and second stories of the house. It was amazing. We finished up about 10:30. 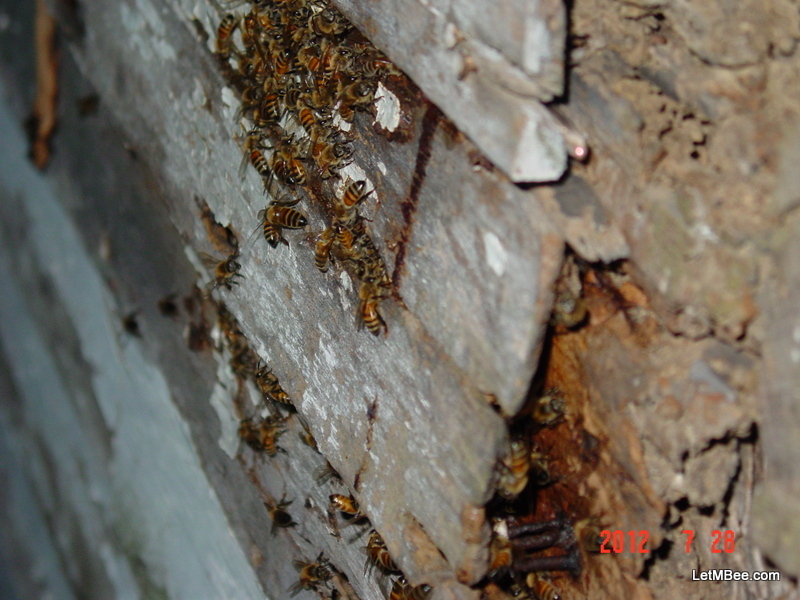 The bees were hived and relocated up the road about 4 miles to a temporary outyard. Later this week Cecil will return to the hive to see if we got the the queen or not. One thing I have discovered recently is that post cutout bees can be quite aggressive for a couple days after you put them in their new home. Don’t make the mistake I did setting a fresh hot cutout 40 yards from your back door. It has the tendency to irritate other members of the household. Have you been a part of any memorable cutouts this year? Do you have any questions? If you have any tips feel free to leave a comment. It was a good one. I hope we got the queen or we were able to place some eggs in frames without messing it up. I found out last week that my cutout was a failure. I got the bees, but no viable queen. Also they were not able to turn any of the eggs into queens. I was heartbroken… a great genetic success story ended at my hand… 🙁 I must either get better at it or just get better at convincing people to LetMBee. That is one dang big hive! How long had those bees been there? How were you guys stung through your suits? I had to learn to wear a long sleeved shirt and a pair of sweat pants under my bee suit. The old house is on the edge of a small town. A local guy watching us said he thought the colony had been there for at least the last 20 years. None of the comb was white and it was all very hard. The guard bees were super evil on this cutout. I have never been around bees that responded like this. I normally have more layers, but it was about 90 at daylight that morning. I didn’t have all my layers on. After the first round of stinging I put a couple of extra shirts on and things got better. I’m still waiting for the beekeeper who was supposed to take the feral bees from the utility pole to collect them…Apparently, this hive is about 10 years old according to some people I asked, but I don’t remember them from that far back. I have noticed that bees have the ability to exist in places and keep a low profile. I never noticed them around before I started keeping em. Now it seems that everywhere I look I see something bee related. I need to get better at cutouts/extraction. It is just so hard to get them out and get that queen laying for you. With the feral hives I am finding around me that have been existing for 5-10-15-30 years I am becoming more and more convinced that swarm trapping is the way to go. I haven’t gotten all of my traps down yet. 😐 I got a call that I picked one up Wednesday…. Don’t know if they will survive or not, but I have quit trying to make those calls. I figure if I catch a swarm it needs to get the chance. I don’t need to be calling the shots for them anymore. I am coming to the realization that it’s not bees with the problem these days. The problem lies with us humans. Many of us are too big for our britches. We think we are smart enough to tell nature the way that things should be….. It may just be the source of many of our problems. If bees ran the world we would have a lot less spraying in agriculture…. What a thought.